Westfalia camper vans build on the Volkswagen van pioneered the camper van world as we know it today back in the 1950's. The combination of a compact van equipped with all the basics of your home was and still is the most practical combination to explore the world far beyond the imaginary fence of your home. The words freedom and adventure are written all over these compact camper van conversions since the first Westy's came around. It's the ultimate adventure vehicle. 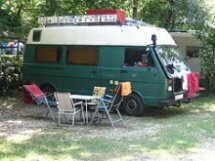 The German based Westfalia-Werke was a coach building company back then and the word is that an American or British officer serving in Germany at the time, asked the Westfalia crew to convert the Volkswagen T1 panel van into a cozy home on wheels. And so they did, the first camper van conversion on earth was introduced to the public and the rest of their success is all history. Westfalia and Volkswagen were launched to the stars with their iconic pop-top roof design a few years later on and Westfalia converted thousands of genuine camper vans on four different Volkswagen models, known around the world for their quality and simplicity. 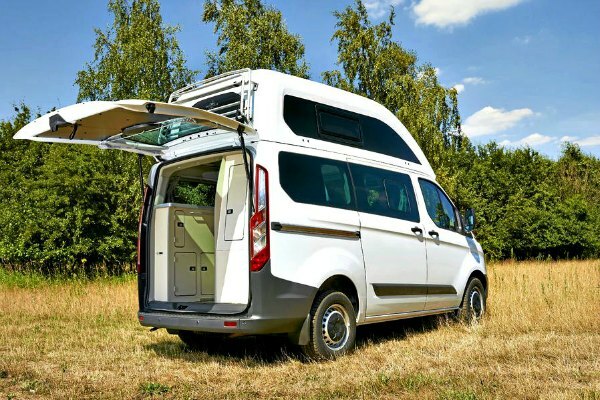 However, along with the legendary Volkswagen camper van conversions, Westaflia also build many other vans from different European manufacturers such as Mercedes-Benz (Sprinter van) and Ford using either their innovative pop top or the later added plastic high top roof designs. After more than 60 years, the same basic philosophy is kept in this legendary company. Converting panel or box vans with their top of the line quality and knowledge in the business. Keeping the legend alive, the Westfalia camper vans. Most of their basic innovative solutions have evolved over the years to higher standards as the Westfalia design crew is constantly pushing the limits of the cutting edge design and long lasting quality used in all of their camper van conversions. So,let's take a look through a short tour of Westfalia camper vans and their features, other than the famous Volkswagen pop top conversion. 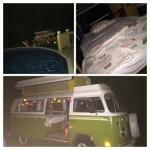 Click here to share your Westy with other visitors to this page! Based on the much larger Mercedes van, the "James Cook" was introduced in 1977. Named after the famous explorer, this camper van conversion is clearly aimed at a more demanding public. 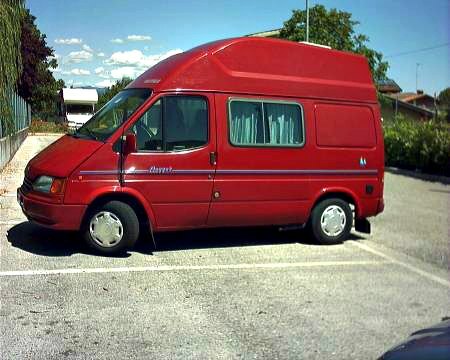 This is a comfortable motorhome like camper van conversion, with a specially designed high top roof, a bathroom, four beds and a lot roomier than the Volkswagen transporter. One of the unique features of this camper van is what I call, a double room concept. 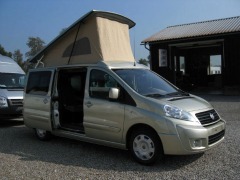 The front part of the van is equipped with a dinette and the Westfalia Vario seat that extracts to a double bed. The other double bed is located just above, comfortably located in the high roof. 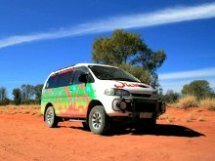 The rear part of the van carries the kitchen, toilet and storage compartment with various storage locations throughout the van. 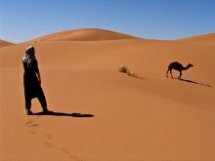 The "James Cook" became a bestseller and soon a symbol for comfortable travel. 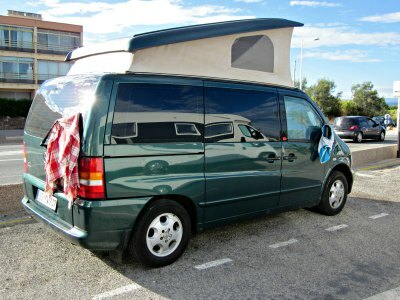 After the first three generations of Volkswagen campers, this was the only Westfalia conversion that was exported to the North American market in 2004 and distributed by Airstream. Only 250 campers were imported though. 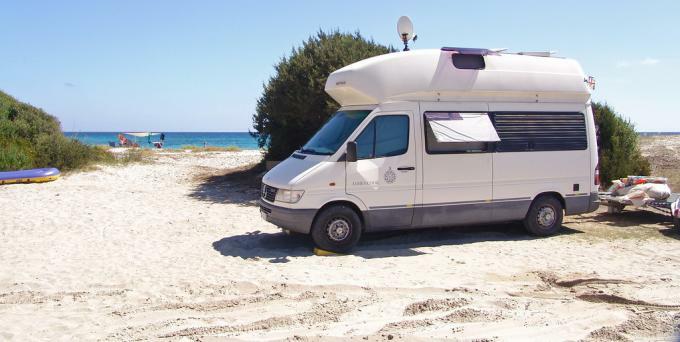 Introduced in 1978 using the larger Volkswagen LT body for the conversion, the "Sven Hedin" is another high top roof comfortable camper, similar to the "James Cook". Both of these models pioneered the use of specially designed plastic high top roofs for greater comfort and to say the truth, there are still many of the early models on the road today. Comfort and quality just speak for themselves here, with using a similar interior layout design. Another long standing relationship was born in the 1980's and therefore the Ford Nugget was introduced. Using the short wheel-base Transit and now the brand new and slightly smaller Transit Custom vans with a new high top roof design, this vehicle features the now familiar double room concept layout with a unique L-shaped kitchen block in the back. There is no toilet room here, but a storage compartment is cut out for the portable camping toilet. This is an agile camper, just a bit larger than a larger family car and the only camper van that I'm aware of, that has five seat-belts and can actually sleep the same amount of people. Well make that three kids, but this is still the best layout for a large family. You really get yourself a perfect daily driver with a kitchen in the back. Nugget comes with both Westfalia roof designs. The pop top and the high top. The Big Nugget with the toilet room and a different layout was added later on, with the difference of using two versions of standard Ford high top roofs. It's made on the long wheel-base Ford Transit platform. 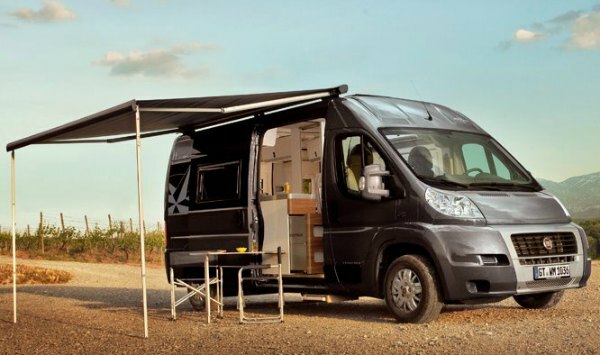 Based on the Fiat Scudo, this camper van comes with a pop top roof and of course a similar layout design as the Volkswagen and Mercedes based Westfalia camper vans. The interior designs evolve from model to model, but the basic layout is the same as it was decades ago. It would be pure non-sense to change something that has worked so well throughout the decades. Both conversions use a very similar layout like the Westy, but using lighter and durable laminates, melamines and fabrics. And the Michelangelo has a cool looking and colorful interior with some innovative features such as two separate sliding seats in the back. 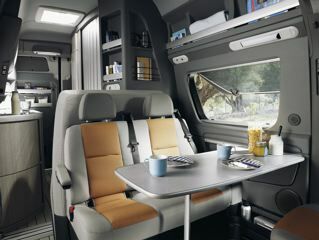 The famous explorers name was used for a brand new line of Westfalia campers based on the smaller Mercedes Benz Vito/Viano vans. 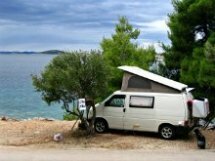 The van and the camper van conversion are very similar to the Volkswagen California and Eurovan conversions. It comes with a pop top roof and many unique features from the house. Today, this is actually the elite pop top camper van, proudly carrying the Mercedes star on the front grille. These are both quite new in the line of Westfalia camper vans and use the Fiat Ducato van for the base. While the high roof is standard, the interior strikes with a brand new design. The materials and colors give a really lively and fresh appearance that always makes Westfalia camper vans stand out from the crowd. The two models have different interior layouts to choose from, including a highly comfortable double bed or two single beds. Equipped with many storage compartments all around, these campers are excellent for extended travel. After a decade of separation, Westfalia goes back to the roots with the "Club Joker" based on the Volkswagen Transporter once again. 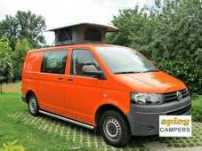 This camper uses a high top bulk head roof and the long wheel-base VW van, very similar to the popular California Exlusive model based on the previous generation of the VW T4/Eurovan van platform. With the Club Joker, Westaflia continues the tradition of the early VW Westfalia models that made the world move around. This is another example of a sharp and unique interior design, using fresh colors and durable materials. The various storage room compartments of various sizes is always a speciality in these campers. The double room interior design is used again, therefore four beds and the dinette in the first part of the van and the kitchen block with the toilet room with most of the storage compartments in rear part of the van. Each Westfalia model sets new standards and the new Club Joker is no exception to this rule. Westfalia also uses a couple of basic vans from Ford and Opel that somehow represent the entry level of Westfalia camper vans. 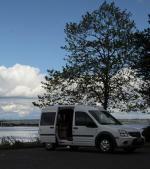 This are basic five seater vans with a folding rear bench and a few neat travel additions. Westfalia camper vans clearly marked the revolutionary concept of one of the most multifunctional vehicles in the world more than 60 years ago. Even with the new models, these are very special camper van conversions of long lasting quality, road capability and safety above all. 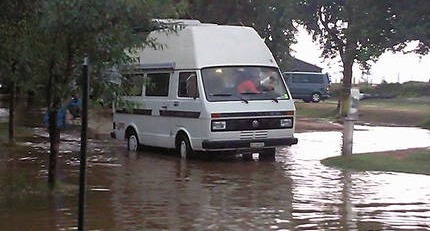 Touring Around In Your Westfalia Camper Van? 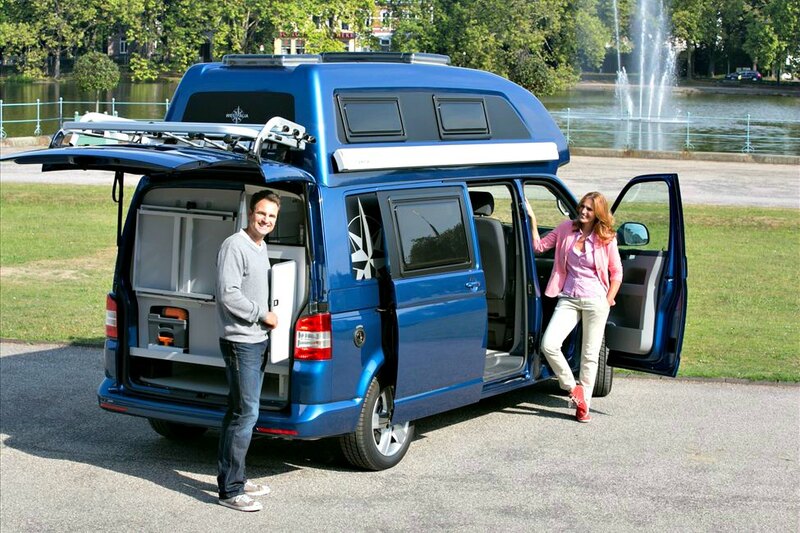 Click here to see the rest of the form and complete your Westfalia camper van review.